On Monday 29th February 2016, Colm from Taliesin Independent Living Complex and Simon from Alberg House, set off on a two-day trip to London to participate in The Annual Culinary Ability Awards, with the support of Nua’s Outreach team, Helena and Lisa. 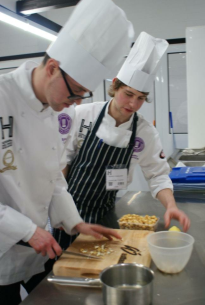 The Culinary Ability Awards is a competition for individuals with a variety of disabilities at trainee level. Entrants compete against each other in a professional environment demonstrating their many culinary skills, talents and creativity. The competition has a substantial roll-on effect as potential employers can then see their talent, and it can be recognised in one of the world’s largest employment sectors with an ever increasing demand for such talent and dedication. The competition is endorsed with the World Association of Chefs and the winner receives a scholarship with the Private Chef to the Queen, Anton Mosimann. Colm and Simon along with many others from across Ireland and the UK, joined with a team of professional chefs at the London ExCel exhibition and conference centre, located on a 100-acre site on the northern quay of the Royal Victoria Dock. All teams setup and cooked from a pop-up kitchen and served to the restaurant ‘La Parade Des Chefs’. As part of the competition rules, entrants and their chefs, were not allowed to view the menu from the previous day. So Simon, Colm and their fellow chefs all worked very hard together to prepare some of the most beautiful dishes and organising and setting up the restaurant for serving their tasty meals later in the evening. Over the course of the day, all contestants were observed and examined closely and each team was scored on their performance at various stages throughout the competition. After a great day’s work, all team members sat back, relaxed and enjoyed a beautiful gourmet meal together and then the awards ceremony was held. For Colm, Simon and their team, the hard work paid off as they picked up medals and plaques for being the winning team!! Well done to everyone who participated and especially well done to Colm, Simon and their team! As a congratulating treat, both men and their support staff spent the following day travelling around London city enjoying an action packed day where they went on sightseeing tours by bus, by foot, and underground, they even took a trip over the city in the cable cars at the London Eye! They also visited Trafalgar square and Oxford Street and viewed Big Ben, the London Tower, Buckingham Palace and much more. Both Simon and Colm had such a great time in London, they would like to return again in the near future. Well done to both on their fantastic recent achievement at the Culinary Ability Awards!